L'Atrevit, un queso de cabra artesanal pirenaico con pimiento; Betara, un intenso queso azul madurado; Tou dels Til·lers, un queso tierno con 3 semanas de curación; y un queso artesanal de Zamora con 24 meses de curación. La calidad gastronómica de los restaurantes Taller de Tapas conquista también el centro de Barcelona. Tal es el caso del local que descubres a lo largo de la concurrida Rambla de Catalunya, que sirve como un break relajado en medio de un día de compras por las mejores tiendas de la ciudad Condal. La carta y las pizarras del restaurante Taller de Tapas – Rambla de Catalunya cuentan con platos de temporada como el Arroz caldoso con bogavante y el Cordero del Pirineo asado con romero y tomillo, además de imprescindibles como las Alcachofas fritas y crujientes, y los Choricitos a la sidra, para picar. 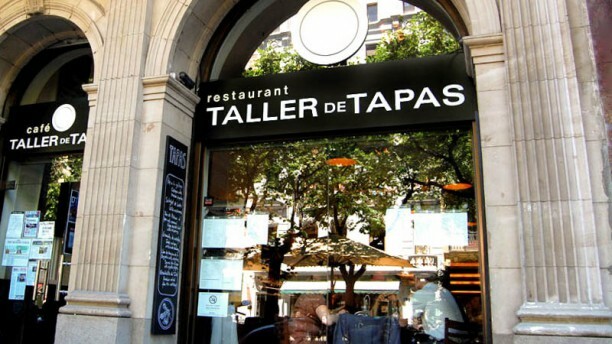 El restaurante Taller de Tapas – Rambla de Catalunya cuenta también con un salón privado que dota de exclusividad tus ocasiones y reuniones de grupo. Tiene una más que notable selección de vinos, cavas y champanes, y estar en su terraza es todo un lujo que debes permitirte. ¡Volverás! Excellent food and a lot of locals hanging around - you really get the Barcelona-vibe. Make sure to enjoy a glass of Sangria! Super helpful and quick staff - overall a perfect evening. Not made to feel welcome upon entering (everyone doing their own thing). Some items of food mixed up (we received tapas we did not order). Squid was undercooked, rubbery and cold upon serving. We tried so many wonderful items! The octopus, croquets, jamon, a cheese platter a fantastic salad wonderful flavor and presentation we loved the location as it was a quieter area. The ambiance was very nice! You can see the fresh fish when you walk into the restaurant. The food was good, but we had a meal with octopus and the octopus was not fresh and very slimey. We got another meal instead. Service was good with solving the problem with the octopus, but the waitress was a bit unorganised. Dinner was very good. Location was perfect and the staff very helpful. Thanks for organizing the booking for us. Excellent prawns, steak and wine. Affordable. Fast and friendly service. Great with kids. Low key but not scruffy. Lavatory ok (considering how other restaurants’ treat theirs). Would definitely go back. Really great service from the team and good food with little waiting time. After four consecutive nights of great tapas away from the Ramblas, we weren't sure what to expect from something so central but this was the best tapas we had by far! Our waiter, Roger, was extremely helpful and knowledgable about the menu, reconmending several dishes to us to help narrow down our choices from the vast menu. We ended up ordering 13 dishes between four of us which was the perfect amount and all of them were simply delicious! Highly recommend the tuna skewer, crispy Brie, mussels and fried aubergine. Cannot comment on availability as we booked a table online in advance earlier the same day, but there were still tables available when we left at 9pm. Overall the service was fabulous, ambience was perfect and food was exquisite! Would definitely return for a different 13 dishes (though the tuna may have to be ordered again!). No ambience. Boring. Looks like a chain restaurant. So many awesome restaurants along the same street. Went there because of ratings....what a waste of a night. Sangria was fair if you like orange fizz. Everything was good., food and service . Good experience as long as you arrive at off peak times-----noisy and CROWDED!!!! Everything was great. Good food and service and a location very convenient to our hotel. Wouldn't hesitate to dine here again. Two things wrong with thefork. One, the address was wrong and two, they do not take reservations. Food was good and service OK. Place was really busy and seemed understaffed. Helps if you speak Spanish.